THINK OUTSIDE THE HOSPITAL BOX! Designed for the post-acute patient by hospitalists, our model of care is different. We focus on quality, not quantity. We believe in active medical management, continuity of care, and open lines of communication. Our dedication to quality helps ensure that skilled nursing facilities receive a good value for their investment when they partner with ARMS. Make a difference—post-acute and long term care patients need you! If you are interested in having an ARMS representative contact you, click here to go to our Employment Opportunities page. We think we have developed a great approach to post-acute care and we would like to partner with additional progressive skilled nursing facilities. In order to do that, we must continue to recruit talented physicians and other providers that can deliver care within the ARMS model. If you are interested in expanding and sharing your skills, continue reading to see how you can get involved with the compassionate, innovative care provided by ARMS. Over the past few decades, hospitals have been reducing length of stay for inpatients. In the mid-1980s, average length of stay was >10 days; today it is 4.7 days. The result is that patients often leave the hospital while they are still quite ill. Many of those patients are referred to rehab-to-home units before returning home. This creates a challenge for those facilities to provide hospital-level care in a post-acute setting. Many of these facilities have not yet increased their physician/provider coverage, even though this presence is needed to care for the “sicker” patient population. ARMS contracts with physicians and nurse practitioners to provide care at our partnering skilled nursing facilities. 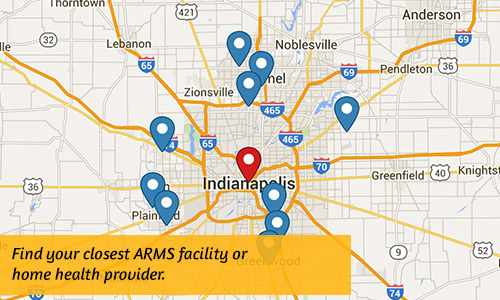 ARMS typically assigns two clinicians to each facility, but this varies due to census and acuity. You will be expected to develop a close working relationship with the facility’s patient care liaison to provide well-coordinated care for each patient. As a provider with ARMS, you will enjoy the autonomy that comes from setting your own schedule, along with the work-flow efficiencies already put in place by ARMS and the facility to which you are assigned. ARMS is always interested in learning about medical providers who have interest in post-acute and long term care. We offer positions that fit almost everyone’s needs from moon-lighting and part-time all the way to full-time options. Want to learn more? Please provide your contact information on the form on our Employment Opportunities page.